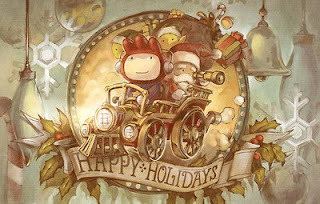 The Gay Gamer: Happy Scribblenauts Holidays! Edison Yan, an artist at 5th Cell, makers of one of the year's best DS games, Scribblenauts, has created a holiday-inspired wallpaper for fans of the portable puzzler. I discovered this little gem while perusing tinycartridge.com, so please go there to download the full-size version.